See more objects with the tag personal, transport, carrying, natural color, net, mesh. See more objects with the color tan sienna rosybrown lightgrey darkolivegreen or see all the colors for this object. This is a Bag. It is dated 20th century and we acquired it in 1969. 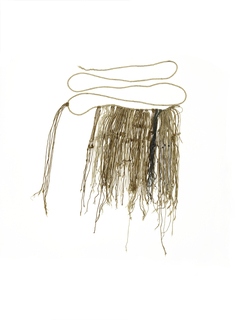 Its medium is leaf fiber and its technique is knotted looping (fisherman's knotted net technique) with twisted loop strap. It is a part of the Textiles department.